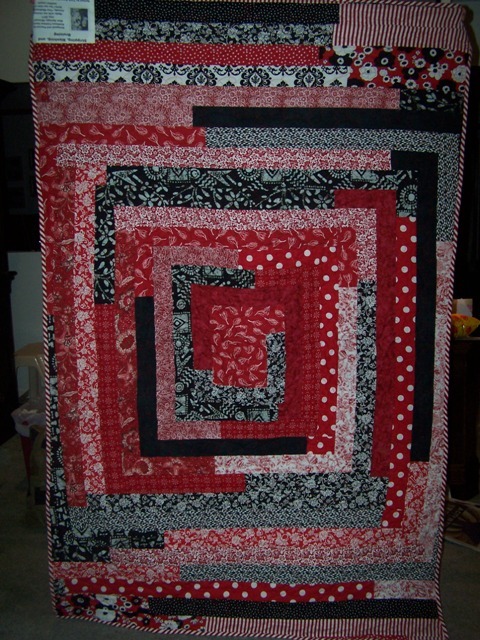 I want to make a Jelly Roll Quilt but don't have any jelly rolls. I never had bought one and am learning about them. I want to use what's in my small stash. Ok I have 5 different fabric I can use for this. How many of each do I need? The one print I can only get 6 strips from. So that will leave me with 4 fabrics. Now could I use four strips of the four then three of the one and back to the four fabrics with four more strips then back to the other three strips and back to the four fabrics of four strips each? That would be a total of 54 strips. Now I don't want this to have all the pieces of the same fabric all together. So is this correct? With that many strips of the same fabric you'll have lots of the same fabrics together. Even with only one strip of the same fabric in a jelly roll you still end up with some of them together since you fold the sewn sections in half to sew them together each time. So would you sew all the strips together in the same fabric or stager them every other one?This is all the fabric I have I can use for this. I'm making it in black and white. I have no solid black or white or I could add those. I am using 3 inch strips because I had some left over and just used that size not to waste any. To be honest, for the same price as a jelly roll, I bought a 1/2 yard of 14 different fabrics and cut 3" strips. I used 42 strips for the front and 42 strips for the back. And, it was about 20 inches longer than if I would have only used a jelly roll. I used a different technique to piece the back. Then I made a Christmas one and had to do some appliqueing. Last edited by kathdavis; 07-09-2013 at 09:09 PM. Sorry, the back didn't post. Kathleen, I love your quilts! The xmas ones are really great! I am planning a baby quilt with strips and applique. Now I see how well it can work. Great job! Your quilts are beautiful. But I don't have that many fabrics . So either I abandon the idea or just go for it. I don't have any red I could put in it either. That was going to be my next idea . I though about orange but don't have that color either. So I just have the 5 different fabrics. You could just go for it and see how it turns out. Or you could cut a few strips from this fabric and start a collection for the jelly roll quilt. Then use the remainder of the fabric for another project. I cut at least one strip from each piece of fabric I buy and add it to my collection. You'd be surprised how quickly it adds up. A jelly roll is typically made up of 40 or so strips with each strip being a different fabric, or not more than 2 strips of the same fabric. If you have only 5 fabrics, a jelly roll quilt will not work up in the same way. I would look for a different type of pattern. It really depends on the pattern you use. If you mean the jelly roll race, I've never made that so I don't know how hard it would be to keep same patterns separated. But some jelly roll patterns would work fine with fewer different prints. I thought there were about 21 different fabrics. Roughly 2 stripes per fabric. Not sure how 5 fabrics would work . you will probably have some of the same fabric next to each other in any jelly roll quilt. with your limited number of fabrics. I would cut the strips in half and mix them up. You will still get the effect but shorter lengths. 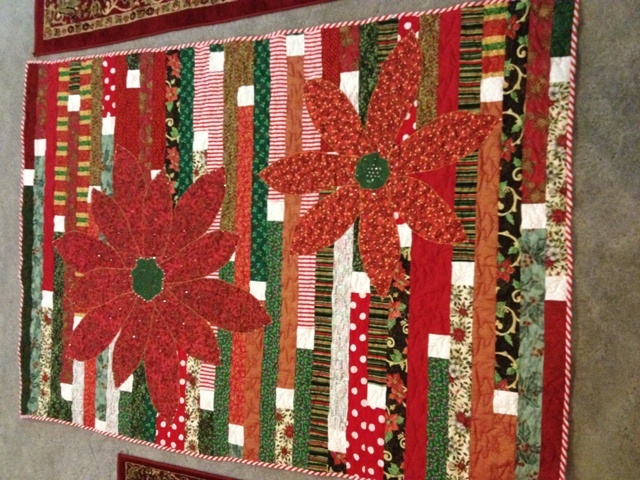 With jelly roll quilts, I don't believe it makes a difference if two of the same fall beide each other. That is the beauty of the style. I would not stress about it Let the strips fall where they will. you could use any other surprise accent color. i like bright lime green with black/white. I would wait until you have more than 5 fabrics. Certainly you could cut strips from fabrics in your stash, or head out and buy some inexpensive fat quarters when they're on sale for 99 cents just to add variety to your quilt. Thank you all for the advice I have more on the way. I love the Christmas trees. And I like that you went BIG on your appliques. Makes for striking looking quilts. Ans another idea to tuck away! Take a look at www.modabakeshop.com for some more ideas for your strips. 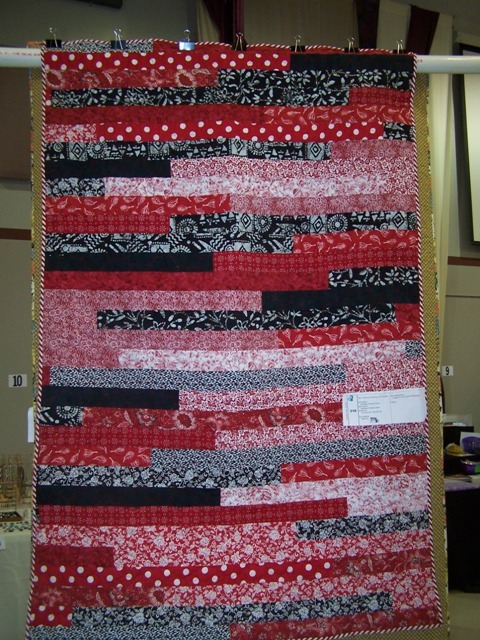 Maybe you can add some borders to your basic jelly roll race quilt. Very nice, love the way you done with applique. What a great Idea, I am going to start doing that, It will make a great memory quilt of all the quilts you have made. Kath, they look wonderful! Owlvamp, you could use another strip quilt pattern. There are a lot on the market. Check the Cozy Quilt patterns. Oh my gosh! 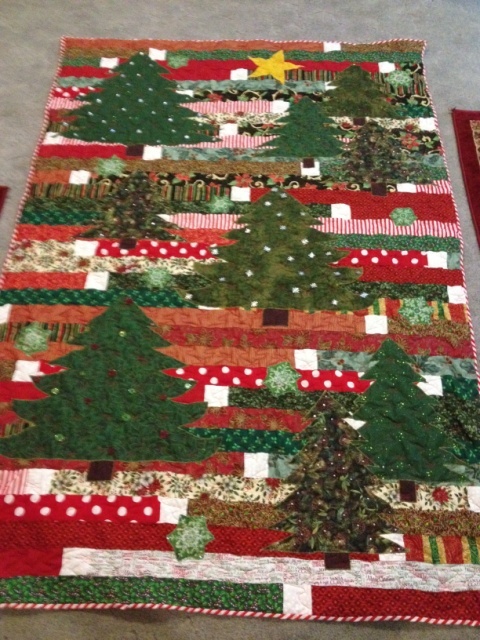 Love them all, but really love that tree quilt! It's like looking at a field of growing trees! Beautiful! And the star makes it perfect! I do agree with KathDavis reply. I do not purchase Jelly Rolls either I make my own cutting 2.5 strips from fabric. 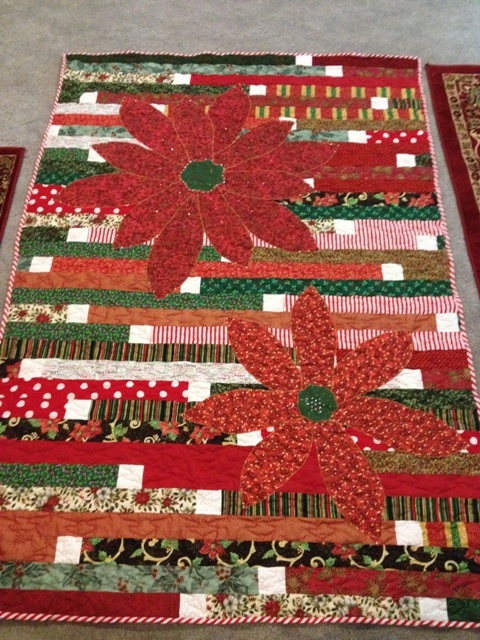 If you go to youtube.com and search Jelly Roll Queen you can see many tutorial about this type of quilt and also Missouri Star Quilting has tutorial on youtube also.